The Venezuelan Supreme Court has requested that opposition leader Juan Guaidó be removed by his parliamentary immunity, a step that could lead to his imprisonment. The constitutional assembly is expected to return the request. Guaidó declared himself a temporary leader in January and received support from more than 50 countries, including the United States. But President Nicolás Maduro also has great allies and retains the crucial support of the military. In a power struggle between the two, Venezuela has seen growing street protests over lack of water and electricity. The authorities have said that they will shorten the working day and keep schools closed due to power cuts. On Monday, the electricity minister Luis Motta, was replaced by an electric engineer. The government has claimed that blackouts are the result of sabotage to force Mr Maduro from office. 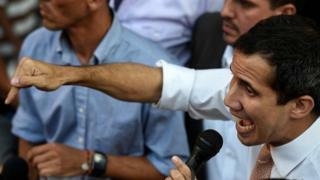 Judgment of the Court said Mr Guaidó should be prosecuted for violating a travel ban when he toured several Latin American countries a few weeks ago. Guaidó has not recognized the decision as any legitimacy and it is unlikely that he will change anything in his attempt to remove and replace Mr Maduro as president, says BBC's Will Grant in Caracas. But our correspondent adds that raises pressure and brings Mr Guido closer to being arrested. The United States has repeatedly warned the Maduro government that arrest or damage to Mr. Guaidó would have "serious consequences". Mr Maduro won a presidential election in 2013 after his mentor's death, President Hugo Chavez. He was elected for another election in 2018 in an election that was considered wrong by international observers. Guaidó has accused President Maduro of being unfit for office and won the support of many in the country as well as US and EU leaders. The Maduro government is becoming more and more isolated, but Russia has expanded its cooperation with Caracas – increased arms trade and credit expansion.